The third case study of NANORESTART has commenced, thanks to the curators at Tate Modern deinstalling Eva Hesse Addendum 1967 from display. Much like Lichtenstein’s Whaam!, Addendum has also been shown in galleries and museums around the world since coming into the Tate collection in 1979. This sculpture is comprised of a softwood box construction covered with a layer of papier mâché. There are ropes extending out of a series of seventeen raised hemispheres (also papier mâché), which are placed at sequential intervals with a spacing progression as follows: 1/8”, 3/8”, 5/8”, 7/8”, 1 1/8” etc.1 Addendum was created for an exhibition in 1967 titled ‘Art in Series’, where artists explored the subject of seriality. Addendum is considered Hesse’s most significant sculpture exploring this subject and is also one of the most ambitious in papier mâché before shifting to more ephemeral material such as rubber and latex. The papier mâché section is suspended from the wall, while the ropes gently gather in loose irregular forms on the floor. These display conditions have resulted in a soiled surface, particularly towards the rope ends but also on the papier mâché section, all a natural consequence of frequent display. Similarly to the first and second case studies, a member of Tate’s Conservation Department – in this case Sculpture Conservator Tamar Maor, has been working with our NANORESTART Conservation Science Researcher Dr Angelica Bartoletti to examine the surface of the sculpture and take samples for analysis which will help establish the materials Hesse used for this work, and facilitate the making of mock-ups to support the conservation treatment. Using the analysis undertaken in the past and additional samples examined by former NANORESTART Conservation Science Researcher Dr Lora Angelova, we know that the grey paint used by Hesse is a pEA/MMA acrylic emulsion paint, which is typical of 1960s acrylic paints, containing titanium white and carbon black pigments as well as gypsum extenders. There is an initial unpigmented coating over the paint layer which is a polyvinyl acetate (PVAc) resin, and then an additional unpigmented coating over the ropes which appears to be an acrylic pnBA/MMA resin. At present, we are investigating more samples taken from the rope areas to try to understand the exact order of the coatings and whether the pnBA/MMA acrylic coating was applied at a later date. 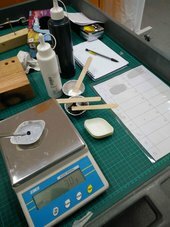 While Angelica is busy analysing the coatings, Tamar has been preparing the mock-ups for the testing we will do to support the conservation treatment. As with all the other case studies, we are trying to create mock-ups which will closely resemble the materials and surface of the sculpture. Once made, these will be aged and soiled so that they can be used to test and refine possible cleaning solutions. By using the mock-ups for testing, we will ensure that we bring only the most promising systems to the sculpture. Over the years several discrete cleaning tests have been carried out on the sculpture, but to date no appropriate treatment solution has been found. The sculpture poses several treatment challenges due to the surface texture, fragility, and the overlapping of different coatings of very similar composition. It is hoped that with the help of technology developed via the NANORESTART project a successful cleaning treatment can be formulated and carried out within the project. For the mock-ups, Tamar has found that the rope is very similar to 16 strand plaited cotton sash cord, typically used for windows, and we have ten metres waiting to be painted with the right paints and coatings. The papier mâché samples are also being fabricated by mixing newspaper and water and allowing it to soak overnight. Once soaked, it is then broken down by hand to create a paper pulp which is then hung in netting to extract as much water as possible before adding the PVA glue that will hold it together. The PVA is then mixed into the paper pulp and hand-pressed onto ten separate boards. The aim is to achieve the same surface texture as the sculpture; involving pinching and pressing the pulp. Once fully dry, these are now ready for the coating and paint layers to be added before being artificially aged in one of Tate’s light ageing chambers, which approximates ageing under museum conditions. 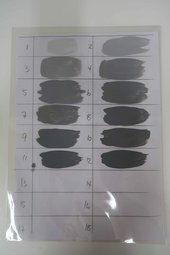 For the paint layers, colour and tone matching tests were done to try to achieve the same shade of grey used on the sculpture. Graduated amounts of black were added to white and painted out as samples using a Lukas paint, which is of a similar formulation to the paint used on Addendum. When the paint samples were dry, these were compared to the sculpture to find the ideal ratio for black to white paint. All Hesse’s work from 1967 is “gray and/or black, predominantly a middle-range gray.”2 Tamar has also been in contact with other museums and galleries with examples of Hesse’s work from 1967, to gain a better understanding of the materials Hesse might have been using at that time. Before the next update we will be focusing on fine-tuning our analysis, meeting with Hesse experts, having extensive photography taken of Addendum, painting and ageing our mock-ups and deciding on the range of cleaning systems we will be considering for the treatment. See you then! 1. Hesse, Eva; November 1967, Statement for Art in Series exhibition, Finch College Museum of Art, Contemporary Wing as cited in Eva Hesse: Sculpture; ed. Serota, 1979. 2. Lippard, Lucy, Eva Hesse, New York University Press, 1976, p.85.